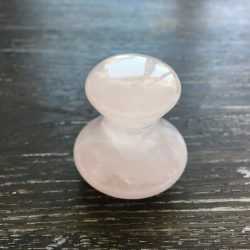 These lovely Gua-sha massage crystals are carved from Rose Quartz crystal. They are highly polished and very smooth to the touch. 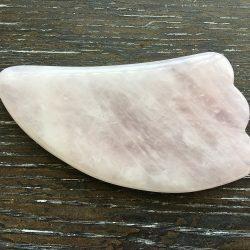 Gua-sha (pronounced gwahshah) is a natural, Middle Eastern alternative therapy that involves rubbing your skin with a massage tool to improve your circulation. This ancient Chinese healing technique may offer a unique approach to better health, addressing issues like chronic pain. Gua-sha is intended to address stagnant energy, (also referred to as qi or chi) in the body that practitioners believe may be responsible for inflammation. Rubbing the skin’s surface is thought to help break up this energy, reduce inflammation, and promote healing and wellbeing. It is also often used to treat muscle pain and tension, and may help to break down scar tissue and connective tissue, improving movement in the joints.